You all remember how the Indian chiefs went with me to see the great American chief, President Grant, in Washington, and what a long ride we had before we took a train. Well, during that trip we rested for two days at Fort Wingate in New Mexico, and here for the first time I saw some Navajo Indians. They are cousins of the Apaches, and the language of the two tribes is so much alike that they can easily understand each other. Some people have said that the word Navajo comes from the Spanish word for knife, but probably it is an Indian word meaning "well-planted fields." There were about 7000 in the tribe and they lived in log huts and raised corn, but their chief living was from large flocks of sheep and goats. From these they got plenty of wool which they dyed in soft colors and from which the women made splendid blankets known the world over for their beauty. These are the famous Navajo blankets you have heard about. All Indian councils are very ceremonious�if you know what that big word means�and every one puts on his very best manners for the occasion. Then Manuelito�splendid fellow that he was�stood up and spoke, for he was the war chief. He said he was all for peace. 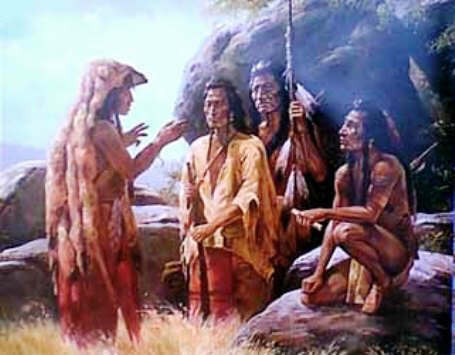 Of course he had had to fight the Apaches, Miguel knew that, but now he wanted a solid peace and to be friends with Apaches and all the Indians of New Mexico and Arizona. Santos spoke in the same spirit and so did Miguel and the others. "Buenos dias, signor! Bueno�bueno," cried Manuelito, as he sprang to the ground and with bridle in hand stood ready to embrace me. Nearby the Navajos had a bivouac, and that night we camped near them. In the morning Manuelito rode beside me and told me that peace had prevailed. When, after riding ten miles, we reached a beautiful spring we lunched together beneath some shady cottonwood trees and then Manuelito bade us farewell. As he and his men rode away my eyes followed this splendid leader, and I rejoiced that so fine a man was using every energy to bring joy and happiness to all about him�a war chief no longer, but a man of peace.